The E-Z Exer-Board is used for restoring use to hands, wrists and forearms. The 9″x13″ board, with a suction cup base, provides a stable platform for 7 tools that offer various resistance. Manufactured by Therafin. Skate Board is vinyl covered hardboard surface with a metal rim on three sides and a hand hole for convenient transport. Outer edge of the board allows the unit to be clamped onto a work surface. 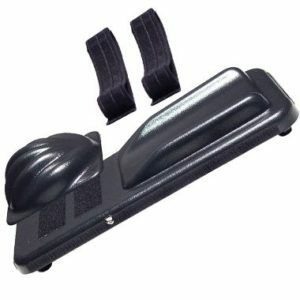 Purchase arm skate and weight resistance system separately. Table not included. Manufactured by Therafin. The Digitometer has 2 scales for the measurement of finger flexion or opposition with calbrations from 0cm to 10cm. Made from transparent break-resistant plastic. The Ergo Arm Skate cradles your arm and positions your hand for range of motion exercises. Wide straps keep your arm secure and comfortable. Four casters allow for easy movement and provide a low center of gravity. Removable Hand Piece stays in the desired position with hook and loop material. Use with optional Weight Resistance System and/or Skate Board (purchase separately). Manufactured by Therafin. 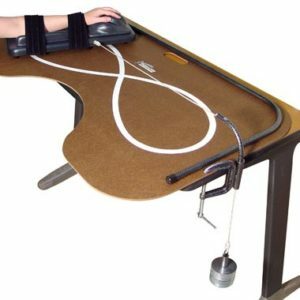 Weight Resistance System clamp holds a Skate Board to the working surface and provides a “pulley” system for weighted resistance/assistance. Nine weights (approx. 4/10 lb. each) are included. Purchase arm skate and skate board separately. Manufactured by Therafin. The Jux-A-Cisor is a range-of-motion exercise device for fingers, hand, wrist, elbow, and shoulder. It’s made of plastic coated steel wire with a thick padded hand grip for easier grasp. Manufactured by Therafin. Weight Resistance System clamp holds the Skate Board to the working surface and provides a “pulley” system for weighted resistance/assistance. Nine weights (approx. 4/10 lb. each) are included. Table not included. Manufactured by Therafin.